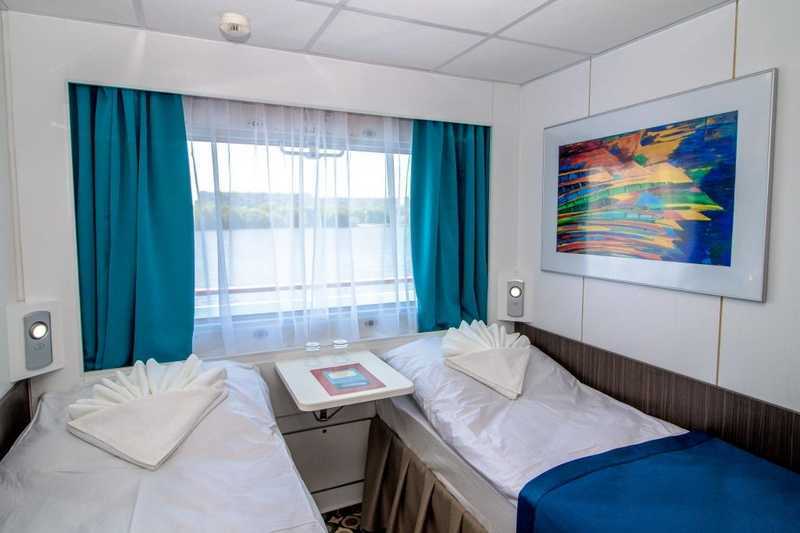 Motorship “Nizhny Novgorod” is a comfortable four-deck vessel (type 301) built in Germany in 1977 and refurbished in 2019. 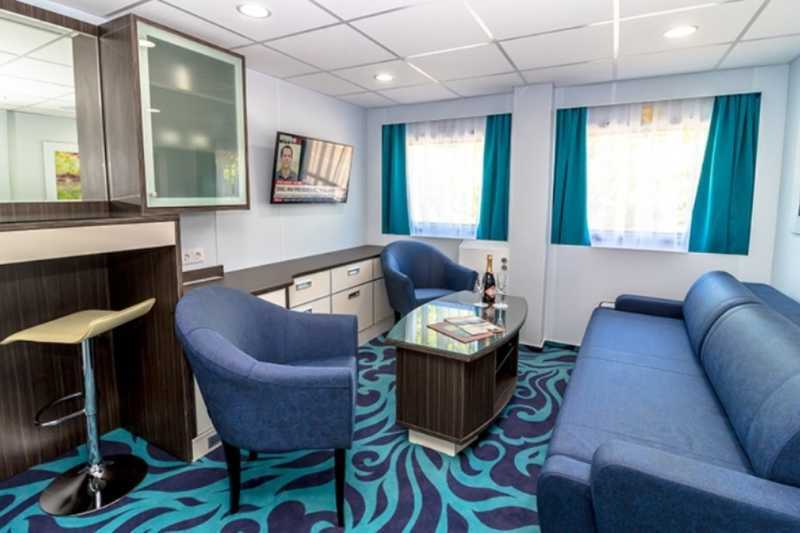 The motorship features 2 restaurants, 3 bars, a conference hall, and a souvenir store. 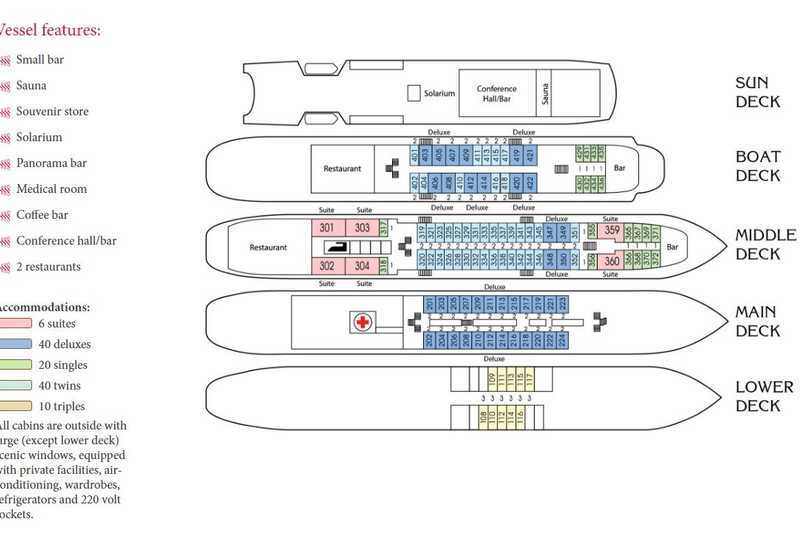 There is also a sauna, solarium and a medical room on board. 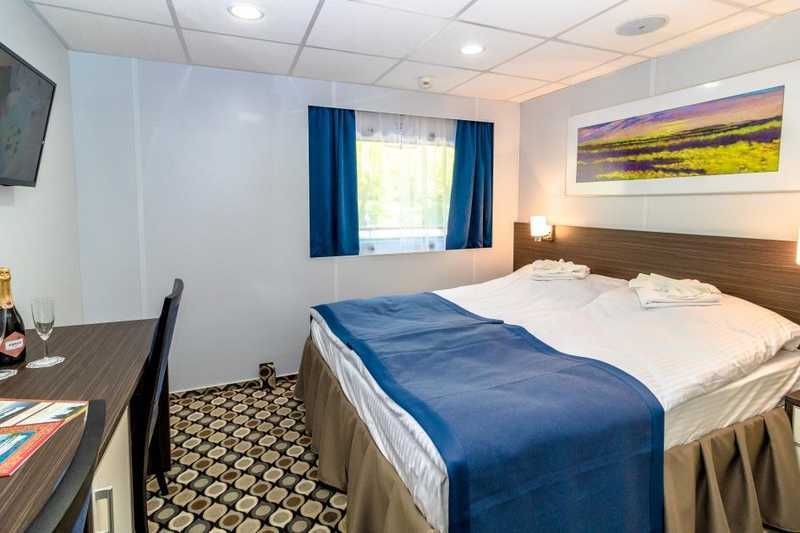 2 room cabin with separate bedroom and lounge area, around 30 square meters, equipped with private facilities, heating and ventilation system, 220 volt sockets, radio, 4 large opening scenic windows. Lounge area is furnished in a stylish way with a roomy wardrobe, occasional table, cushioned furniture, TV/video, refrigerator. Bedroom is furnished with a king-size bed, wardrobe and console-mirror. Suite can accommodate up to 3 people. Extra bed type - folding-bed. 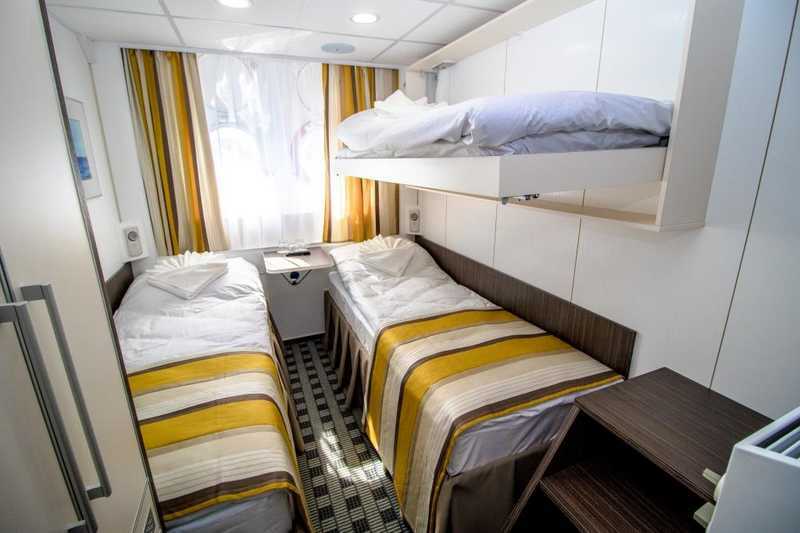 Spacious twin cabin with a large opening scenic window, heating and ventilation system, wardrobe, 220 volt socket, radio. 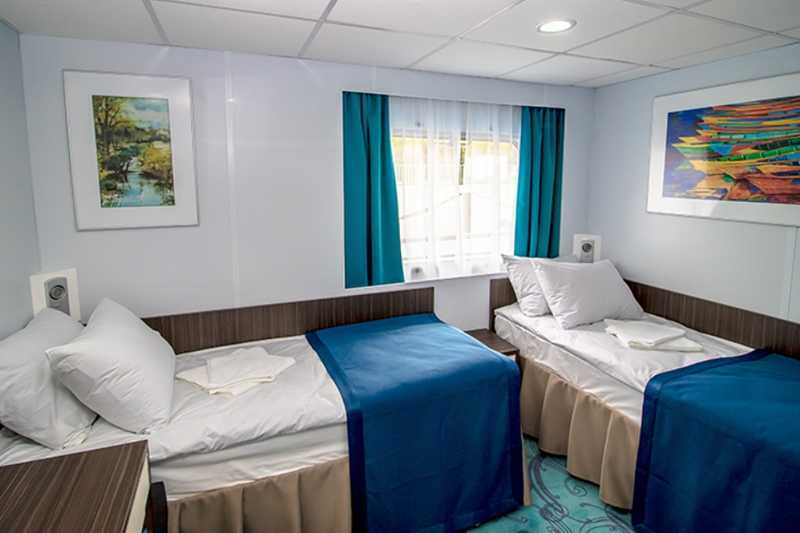 Cabin is equipped with new furniture and lighting; decorated in modern style. Spacious twin/double cabin with a large opening scenic window, heating and ventilation system, wardrobe, 220 volt socket, radio. Cabin is equipped with new furniture and lighting; decorated in modern style. 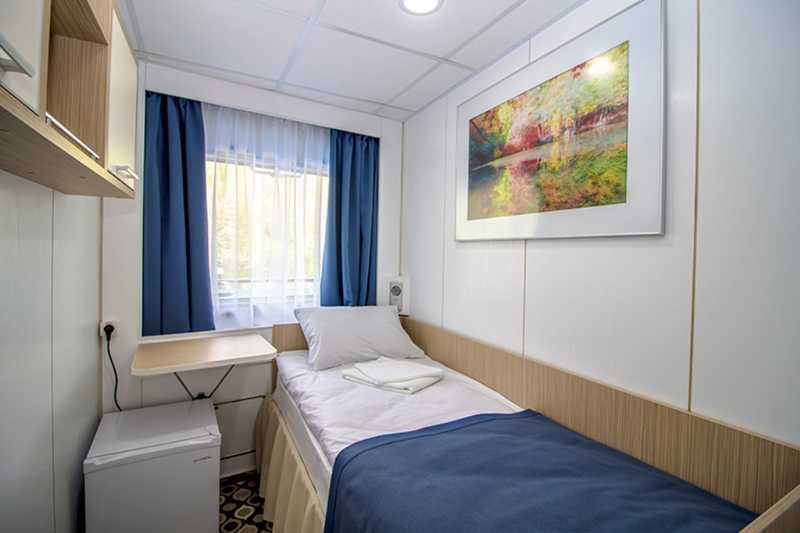 One-bed outside cabin with a large opening scenic window, private facilities, heating and ventilation system, wardrobe, 220 volt socket, radio. Equipped wit new furniture and lighting; decorated in modern style. Two-bed outside single-staged cabin with a large opening scenic window, heating and ventilation system, wardrobe, 220 volt socket, radio. Cabin is equipped with new furniture and lighting; decorated in modern style.